Our church is a branch of The Mother Church, The First Church of Christ, Scientist, in Boston, Massachusetts, founded by Mary Baker Eddy in 1879 "...to commemorate the words and works of our Master, which should reinstate primitive Christianity and its lost element of healing." 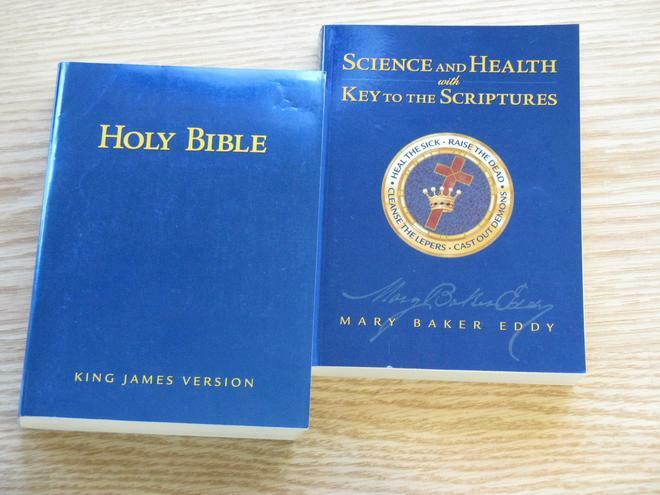 Each Sunday, at 10 AM, two lay readers, a First and Second Reader (who are elected from the membership) read a Lesson-Sermon consisting of selections from our Pastor, the King James Version of the Bible and the Christian Science Textbook, Science and Health with Key to the Scriptures by Mary Baker Eddy. This Lesson, which is contained in the Christian Science Quarterly, is studied daily during the preceding week by students of Christian Science. Wednesday Evening Testimony Meetings, at 7:00 PM, begin with specially selected readings from the Bible and Science and Health. Testimonies by members of the congregation follow, telling how the study of Christian Science heals, uplifts, inspires, and guides them through a better understanding of God and one's relationship with Him. This church is here for you. Please join us for one of our services and learn about the lost element of healing in Christianity. We look forward to your questions. Or visit us in our Reading Room at the corner of Butte & Court Streets. We are open Tuesdays through Fridays from 11:00 a.m. to 4:00 p.m.
​Christian Science Practitioners are dedicated to healing and spiritual growth and can help you. A world-wide list of Practitioners is available in the Christian Science Journal or on JSH-Online. A free copy of this publication is available in the lobby of the church or ask any usher to assist you. You and your family are very welcome.